We are receiving a large number of calls from customers concerned about Elm Leaf Beetle (Xanthogaleruca luteola) infestation. The olive and brown beetles are around 4mm long and have come out of hibernation in force. Symptoms of Elm Leaf Beetle include defoliation, discolouration, shot holes, and skeletonisation of leaves between August to February. If you are unsure if you have the beetle you can email us a photo to [email protected] or book an elm leaf treatment online or call 1800 873343. The beetle and grubs can skeletonise a tree in two weeks. They eat the tree canopy causing tiny shot holes on the leaves. The females lay hundreds of eggs on the underside of the leaves. The larvae or grubs hatch and feed on the underside of the leaf. The grubs crawl down the trunk and pupate in bark cracks or around the base of the tree. The pupate emerge as adult beetles and return to the foliage to continue the cycle of destruction. The Elm Leaf Beetle affects all types of elms (Ulmus) with the exception of Ulmus parvifolia, the chinese elm. The best time to treat elm trees is NOW. Stem injection can be done any time but ideally before the beetles have laid their eggs or just after the eggs hatch. Trees should be treated every three years. While it’s impossible to stop Elm Leaf Beetle you can reduce the stress to trees by keeping them well watered in dry periods and using a slow release fertiliser. Remove any dead wood and suckers. Early treatment is essential to reduce the impact of the Elm Leaf Beetle – it can’t be eradicated but it can be managed. For tree trunks >200mm diameter we recommend trunk injection with Imidacloprid*. This is widely considered to be the most effective and environmentally sound option. The chemical is transported by the tree to the leaves where it kills the beetles. Beetles only need to ingest a small amount of leaf material for the chemical to kill them. You will see dead and dying beetle on paved areas. Trunk injection is safe around children, pets and riparian situations. Treatment should last around three years. For young trees we recommend canopy spraying Foliar sprays towards the end of October. This is generally not possible on older trees due to the size of large elm trees. Foliar sprays need to be applied annually. If you prefer a non-chemical approach you can try wrapping adhesive tape around the trunk in a strip about 20cm wide, with the sticky side facing out. This can help to break the Elm Leaf Beetle lifecycle. Non-chemical control banding can trap larvae as they migrate down the trunk between December and early February. You will need to monitor the tree to see when the larvae are crawling down the trunk as this can vary season to season. This won’t reduce damage immediately but can reduce beetle numbers and damage in subsequent years. This method, while environmentally safe, may not be effective against heavy infestations. TreeWorks does not recommend soil injection! 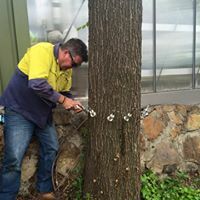 Injecting the soil under the drip line of the tree requires up to 100 L of water per tree. Soil injection is detrimental to soil flora and fauna, including earthworms. Applications near creeks and rivers or near food gardens pose particular risks for invertebrates and human health as it will kill everything in the soil. The movement of the chemical is slow the injections need to be carried out around 6-8 weeks prior to the beetles emerging from hibernation.